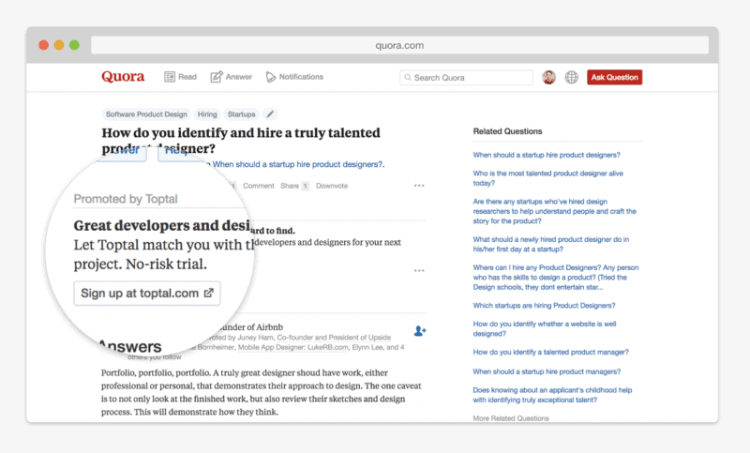 Quora has now opened its self-serve ads platform to advertisers globally. Earlier the platform was in beta and more than 300 advertisers ranging from different verticals have been using it. Shopify, Hubspot, Thinkific, Udacity and Hired are among the companies that have been running campaigns. Quora presently offers two native ad formats: text and app install ad that run on question pages and include a call-to-action button. Ads are sold on a CPC basis in a real-time auction, and campaigns can be targeted by topics, location and device. The platform is insightful to those who have used AdWords or Facebook Ad Manager, and conversion tracking via a pixel has been accessible from the start. For app install attribution, Quora partners with several third-party measurement providers, including Adjust, AppsFlyer, Kochava and Tune. Attribution, targeting capabilities and Ad quality here are the areas of focus. Ads endure an arrangement of automated and manual review for approval before they can run, and users have the option to flag ads they no longer want to see. Yet, Quora ads are only supported in English.